Darklore is a journal of exceptional observations, hidden history, the paranormal and esoteric science. Our roster of writers includes some of the biggest names in the 'alternative' field - Robert Bauval, Daniel Pinchbeck, Loren Coleman, Robert Schoch, Nick Redfern, Stephen Braude, Lynn Picknett and Clive Prince, and many more. The reason? Because our main goal is to provide a quality reading experience, and funnel all profits from the sale of the book back to the writers and researchers themselves, rather than the usual middle-men. As such, we hope you support our venture, in order to empower good writing and research in alternative genres. In order to offer the best value to both readers and contributors, we have adopted an Internet-only publishing model. Therefore, Darklore is primarily available from online booksellers such as Amazon.com and Barnes and Noble. However, we would love to move, if posssible, to a subscription-based publishing model - which would allow for lower pricing of the book itself. If you would like to register your interest in subscribing and future releases of Darklore, please send an email to us using the relevant email address on the Contact Page. Please be assured - this not a commitment to future purchases (it simply lets us know you're interested), and your email address will not be used for any other purpose. We value your privacy unreservedly. 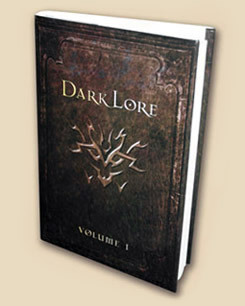 We are extremely proud of the finished product, and are sure you will enjoy the wonderful reading in Darklore. We look forward with enthusiasm to bringing more of the same quality to you in Volume 2.